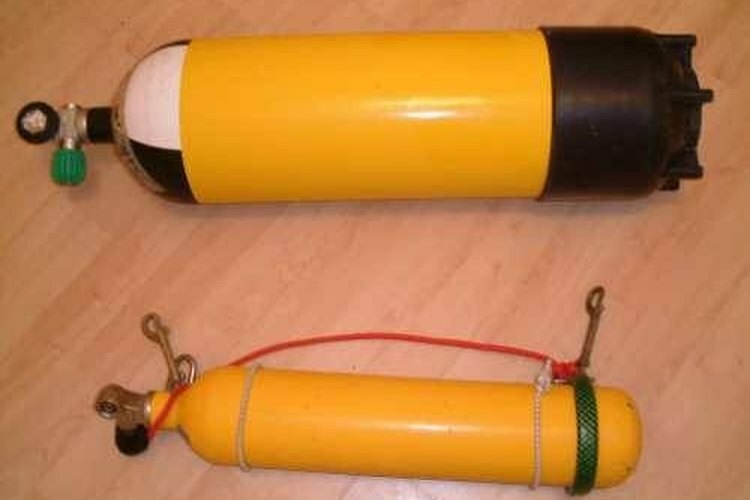 Scuba tanks (cylinders) are bottles of compressed air that enable divers to take stored air underwater, but to breathe it under pressure. The filling procedure is pretty straightforward, but despite its simplicity it remains hazardous to work with highly compressed gas, and so should never be taken for granted. Also, it has become popular to use enriched air mixes like nitrox for deeper dives, and these use a somewhat different filling procedure. Check the cylinder for safety before starting the process. Start with the hydrostatic testing date on the side of the cylinder, as a not-up-to-date cylinder might not be damaged or degraded. Then open the bleed valve and empty the cylinder down to 10 pounds per square inch (psi) or less, and shake the cylinder while listening for any water or debris that might be inside. If there is, do not fill the cylinder. Finally, look at the nozzle for rust or damage, and make sure the o-ring is intact. If nozzle problems cannot be fixed, do not fill the cylinder. Check the rated pressure of the cylinder. That is usually engraved on the side of the container. Set the air compressor controls to automatically shut down when the pressure from Step 2 has been reached. Place the cylinder into the water tank. This is a cooling tank, because as the cylinder fills with compressed gas and comes under greater pressure, it will heat up. When it cools, the gas in the cylinder will contract, reducing the pressure. To get a full cylinder, it is best to keep it from getting too hot and thus reaching maximum pressure prematurely. Close the bleed valve on the cylinder, then attach the valve yoke to the cylinder nozzle and clamp it into place by tightening the knob. The yoke will vaguely resemble that of a scuba regulator. Open both the bleed valve and the valve on the compressor's yoke. Start the compressor and let the cylinder fill. Close the yoke valve and the cylinder's bleed valve when the cylinder is full, then disconnect the yoke. Perform the aforementioned safety checks on the cylinder and put the cylinder in the water cooling tank. Close the bleed valve and attach the yoke valve from a bottle of compressed, pure oxygen. Open the valves and partially fill the cylinder to the right proportion for the desired nitrox mix. Mix 1 is for depths of up to 110 feet, and uses 32 percent oxygen. Mix 2 is for up to 95 feet, and uses 36 percent oxygen. Ordinary air already has 21 percent, so you want to fill the tank to either 11 or 15 percent, depending on the mixture chosen. Use the gauge to monitor progress. Close the valves, disconnect the cylinder, and then connect it to the air compressor. Fill the cylinder the rest of the way with ordinary air. If you are storing a cylinder for awhile, put 100 to 300 psi of air into it to keep moisture from entering. Handling scuba air compression equipment requires certification from the Occupational Safety and Health Administration (OSHA). Working with highly compressed gases of any kind is hazardous work, and this guide should not be mistaken for proper training on the subject. Those without proper certification should not operate scuba compressors without proper supervision. Scuba compressors have air filters that prevent divers from being poisoned by breathing impurities in regular air that are greatly compounded when that air is inhaled under pressure. Do not attempt to use a common air compressor to fill a scuba cylinder.